Stamps and Stitches: Magnifying glass anyone? didn't even notice they were upside down. I thought it was cute... and quirky! Great job! Well, it was worth the search! Awesome card!!! What a great card! I've managed to drop one of those teensy letters myself. You'd think it would be easy to find on BLUE carpet... I was just thankful that my puppy wasn't in the room with me - because if HE found it, well... I'd be short a letter. This is awasome, Love the torn paper...I'm sorry you were having such trouble but I glad you were able to recover your stuff and find it atlast. Most of the stuff I lose seems to always be right in front of me and it takes my daughter to uncover it for me...drives me nuts most days!!!! I didn't even notice the S until I read your edit comment. The card is great. I like how your tore the edge and the colors you used are great. Wonderful card!! I love that patterned paper!! Love the torn paper with the stitching and the Just Right accent piece looks great (I didn't notice the 's' either)! The card turned out beautifully! I feel your pain about the logo. I didn't realize there was one until I made a card and saw it after I glued the paper on. Those are some tiny little alphas you got! I love it, so cute and the upside down S just looks funky! I just realised that FUNKY does not mean the same in the States as it does here... so it just looks COOL! thanks a bunch(hehehe) for the sweet comments over @ my blog. Nice job on the card! Love the colors and stitching. I looked but couldn't tell that the "s' was upside down. Cute card. you can't tell the s's are upside down. Aren't those letters TINY?!?!?! I have to use the tweezers in order to do anything with them! beautiful card - are you enjoying your just rite set? i was thinking of gettng one too - but am still on the fence... :) love your story -- i have the same problem with my carpet... :) your card just turned out lovely! I just tried one of these Just Rite stamps at a friends house. She showed me the teeny tiny letters and I could barely see them! But I'm still intrigued by the idea of it so I may eventually end up getting one anyway. I know what you mean about the SU logo on the designer paper. More than once I have had that happen too. 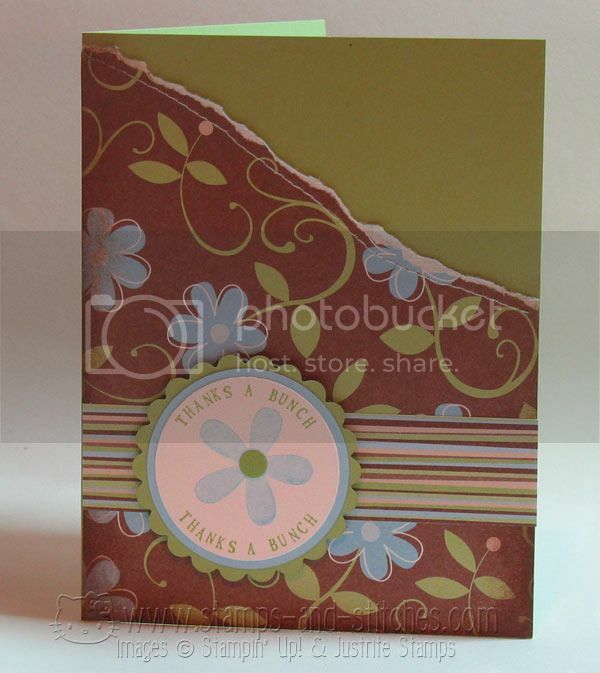 Gale, this is a cheery card, love your layout and really like the horizontal dsp- such a neat look.